After a natural glow this spring? Then add some papaya to your plate! Divide ingredients into two bowls. Sprinkle with spring onion and sunﬂower seeds, and drizzle with dressing. Serve immediately. Tips: You can substitute frozen corn kernels for fresh and simply sauté them with a tsp of dressing before adding to the bowl. Excellent weather conditions and an increase in plantings has resulted in a record season for Australian papaya, with an abundance of fruit set to hit stores from September onwards. The start of spring marks a key peak for the unique fruit, and thanks to a good dose of tropical sunshine there will be plenty of sweet papaya available from all growing regions. President of Papaya Australia and Mareeba (QLD) papaya grower, Gerard Kath is looking forward to seeing the bumper crop hit stores. "Each year production is growing to keep up with demand. We're seeing existing growers expanding their farms, as well as new growers starting up. This coupled with great weather has brought a record volume of fruit this season," says Gerard. "Spring generally brings a harvest with high quality fruit and this year is no exception. We're excited to start picking the new-season fruit, which will be available in stores from the start of September." 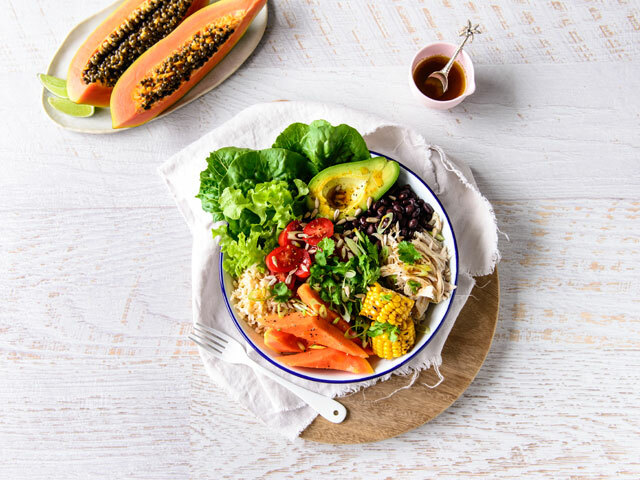 Not only does papaya deliver a taste of the tropics, accredited practising dietitian and Australian Papaya ambassador, Caitlin Reid says that it's the perfect healthy snack to include in your diet. "Papaya is packed with goodness which is vital for overall health. Just one serve (150g) packs in essential nutrients like vitamin C, vitamin A, folate and fibre. Papaya is also low in kilojoules and has a moderate glycaemic index (GI) so they keep you fuller for longer," Caitlin says. "Mums, bubs and mums-to be in particular benefit from the unique combination of antioxidants in papaya because it helps growing bodies develop and stay healthy." Whether you enjoy it fresh with a squeeze of lime, use it to top off your brekkie bowl or add it in a flavoursome curry, papaya is a delicious fruit that adds a tropical touch to any sweet or savoury dish. •	Maturity is key – Get the most of your papaya experience by eating fruit that is at the right stage of maturity. The full-bodied flavour of papaya only develops in fully ripened fruit – so look out for fruit with slightly yellow skin. Or if you love a green papaya salad, then dig in when the papaya is still under-ripe. •	Perfect pick – Give your papaya a gentle squeeze under the stem. If it's ripe, it will give slightly. If it's a bit hard, pop your papaya in the fruit bowl to ripen. •	More vibrant the better – When selecting pre-cut papaya, look for vibrant coloured flesh as this ensures that it will be flavourful and ripe. When the fruit is paler and lacking vibrancy your fruit will be less juicy and flavoursome. •	Sign of sweetness – The freckles on the skin of a papaya is not a sign of damage, it's a sign of sweetness – so don't shy away from a nicely freckled fruit. Fruit that is grown in-land regions of Australia gets this freckle across the skin, whereas coastal-grown fruit can be clean skinned and just as sweet! •	Ice Ice Baby – Papaya can be an incredibly refreshing snack when it's kept cool like a watermelon. Once ripe, store your papaya in the fridge and enjoy with a squeeze of fresh lime for a zesty spring snack. Spring and autumn are the peak seasons for Australian papaya and papaw but it is available all year round.